Hello there! Thought everyone might need some weekend inspiration and motivation, so I’ve got a little guest post for you today! 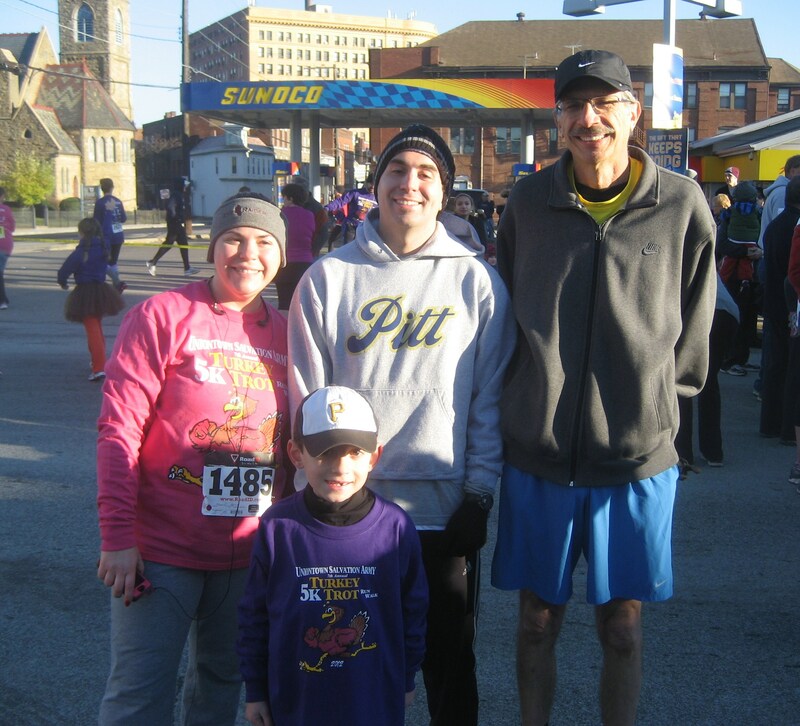 As you may or may not know, I started running more or less about 18 years ago…my little brother was a runner too. And there was one more runner in the family, my dad’s older brother, our Uncle Joe! 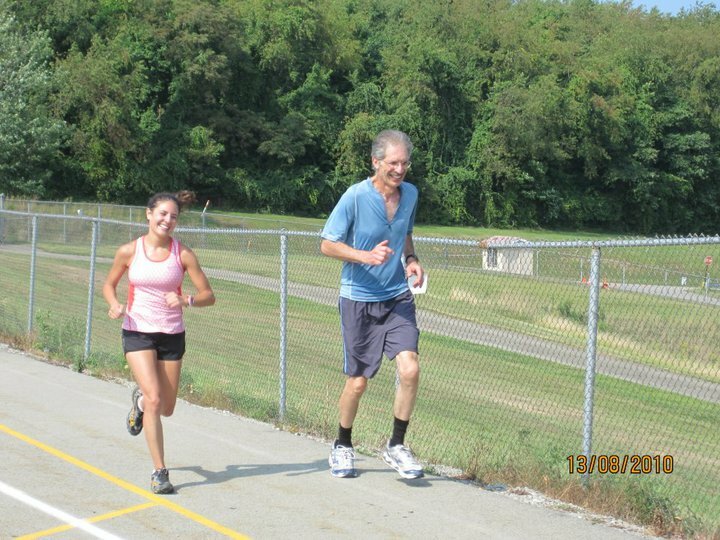 Me and Uncle Joe rockin the Laurel Highlands Sr. High Alumni Cross Country Race! And me, and my brother, and my Uncle Joe, well, we’ve kept on running over the years. And we’re our own little running family. The running Georges (minus Little E!) Beth, Uncle Joe, Pooky & Me! We all won that day too! 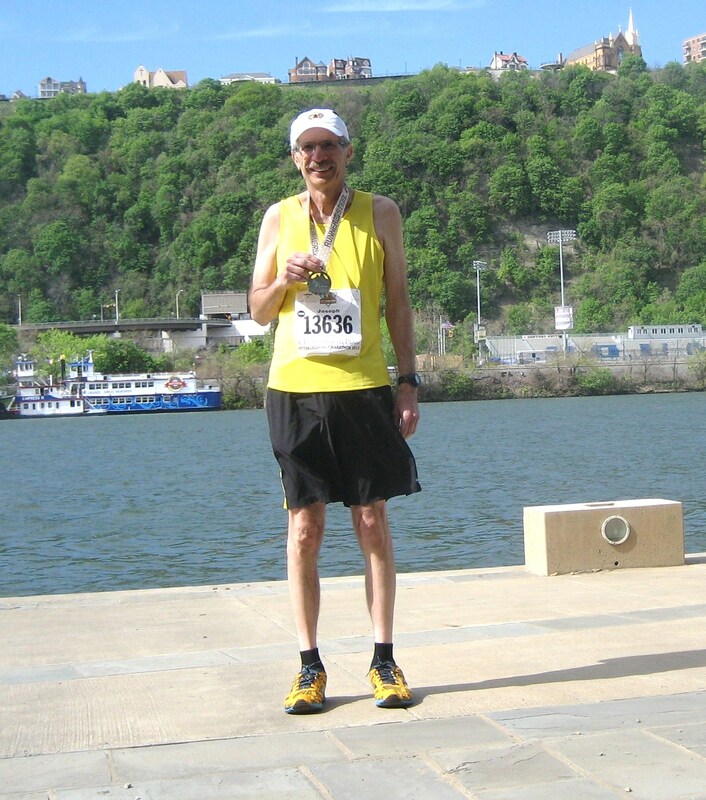 And Uncle Joe – he’s 66 years old now – he’s still going … and according to his 2:09 half marathon performance at the 2013 Pittsburgh Half Marathon… he’s still going strong and is truly a Runner of Steel! 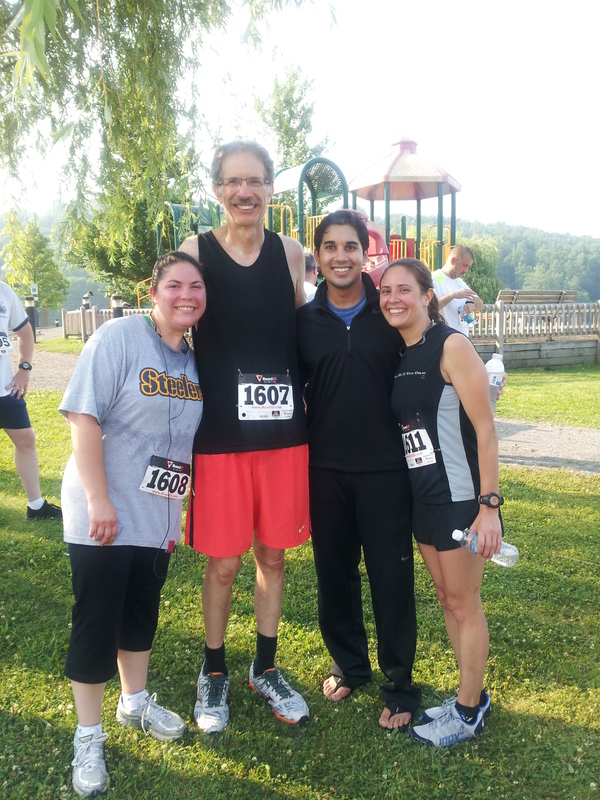 From the Goat: And…the rest of the running family (again, minus Little E)…Beth Ann, Darren, Phil & Uncle Joe! In honor of this awesome performance – I asked him to write a little guest post about his experience at the race! I mean, if he’s still running – and running pretty fast – at 66, then you have no excuse – right? And from the looks of it, it turns out that not only running fast runs in the family but also stellar blogging lol. 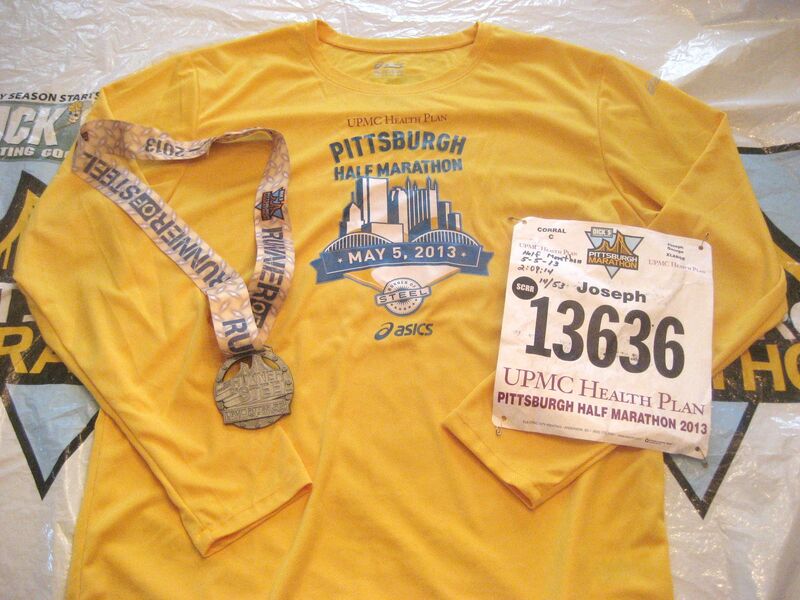 Enjoy – and big congrats to Uncle Joe and everyone else who ran the Pittsburgh Half Marathon this year! It all started two hours, nine minutes and fourteen seconds ago there I stood in singlet and shorts anxiously waiting my turn to tour 13.1 miles of Pittsburgh’s bridges and neighborhood. This morning in Southwestern Pennsylvania presented near perfect weather conditions. Sunny, dry, low humidity and temperature in the breezy 50’s. You could feel an air of excitement, caution (with tightened security) and reverence to our running brothers and sisters of the Boston tragedy. A moment of silence along with shirts, wrist bands and the accommodation of 37 Boston runners who were unable to finish the April 22nd race. My strategy for the race was to run mile splits at a comfortable hard pace. Last year I went out too fast struggling the last few miles. My training for the past four months had been erratic so I was unsure about what pace I could hold. I estimated around a ten minute pace which came close to the 9:52 that I averaged besting my time from last year by two minutes. As in previous Marathon years Patrice Matamoros with her team and many volunteers pulled this one off successfully in light of the Boston bombing. The Half Marathon course is mostly flat with a few short rolling hills with five inclines coming from the five bridges to be crossed. The Marathon course as well crosses five bridges with one steep climb up into the Oakland neighborhood and again with a few short rolling hills and a lot of flat area. Along the course bands provided entertainment and motivation along with many spectators throughout the thirteen Pittsburgh neighborhoods. Race organizers provided fluids, gels and medical facilities along the route. The amenities (fruit, fluids, sweets) continued at the finish. Point State Park was used as a reunion area and finish line festival area providing many recovery aids. From the Goat: Uncle Joe looking great and rockin’ his medal after a stellar half!!! There was a record setting 22,143 finishers in all distances. As a result organizers had wave start with corrals A,B,C,D,E to ease congestion the first three miles. James Kirwa from Kenya won the mens Marathon race in a time of 2:13:37. Mary Akor from California won the womens Marathon race in a time of 2:37:35. On a sad note one of our fellow runners 23 year old Kyle Johnson collapsed at mile 12 and later was pronounced dead at a local hospital of “a inherited abnormality of the coronary artery system”. Race director Patrice Matamoros said its a loss for the entire Marathon family, our hearts and prayers go out to his family. I missed wishing friends good luck because of the large crowd and corral assignments. I did see two of my fellow runners by chance at the finish line festival, then using texting and facebook to hand out accolades to my other race friends. The ideal weather conditions presented many racers with the opportunity to achieve a personal best time. One of my friends Laura bested her 2012 Marathon time by 15 minutes. Following the pack mentality she fell in with a pacer group that pulled her along. Pittsburgh area is known as the city of bridges(446). Its location is where three rivers converge. The Allegheny and Monongahela flow together forming the Ohio.. One of the pictures posted was taken in the Mon Wharf parking area showing the Monongahela river in the background. 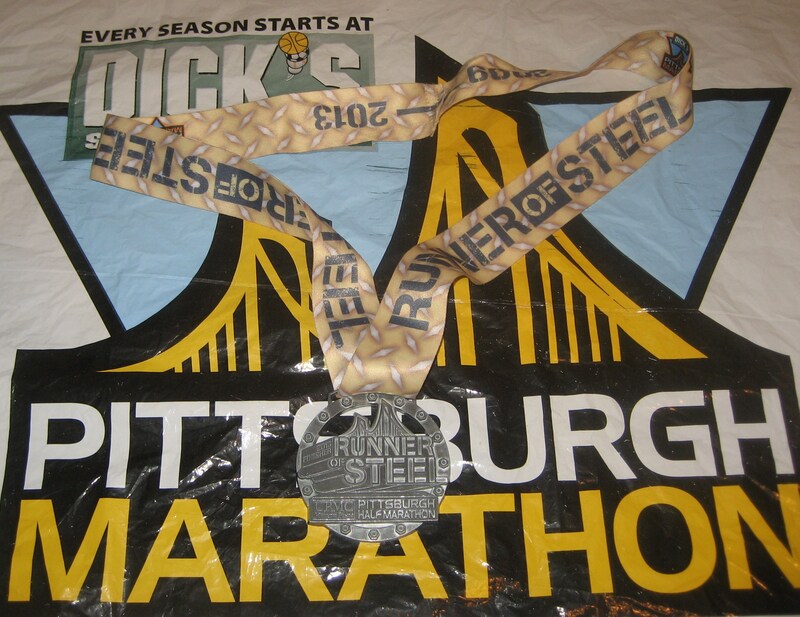 The medal given to all finishers honors Pittsburgh’s past by having the logo “Runner of Steel” engraving (picture posted). From the Goat: I am SO jealous. Runner of Steel??? Best medal ever! I would highly recommend Pittsburgh as a class one destination Marathon and Half Marathon race. I myself have run both and am already thinking about next years event.